Since the days when your great, great granddad used one of those ear trumpets to hear, things have changed. Newer hearing aids are able to do so much more than these devices could do even a decade ago. The innovation of hearing aid tech allows users to participate in activities that were unlikely at one point. Just consider these seven things hearing aids are now able to do. Jogging or riding a bike with a hearing aid in would have been risky in the past. Even the highest quality hearing aids are subject to damage if they fall out while you are on the move. Today whether you are an athlete or beginner you can exercise while your hearing aid is in. However, the change is not only in the technology. Hearing aids that fall out can still become broken or lost. The simple idea of a hearing aid retention cord solves the problem. Think of it as a lanyard for your hearing aids. They slide on to the devices and then clip to your clothes for safety. Hearing aid retention cords area great option for kids, too. 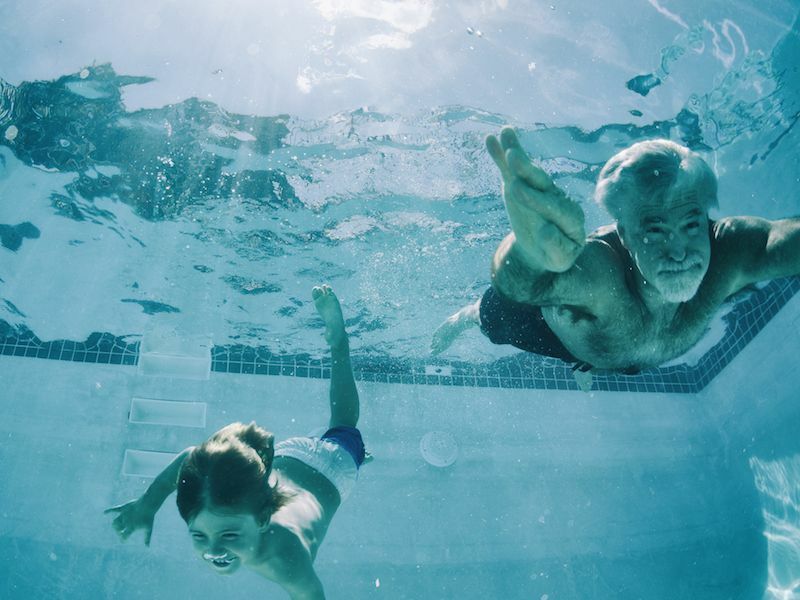 While it is true most hearing aids are resistant to water, they still don’t do well when fully submersed. Instead, if you want to go swimming you’ll need to get waterproof hearing aids and think about some accessories. Start with a raincoat for your hearing aids. Your device is shielded by waterproof sleeves that fit snugly over them while still allowing you to hear. Most of the sleeves have cords that connect to your clothing too, so you don’t lose the hearing aids while enjoying some summer activities. Another thing you may want to invest in is a dehumidifier for your hearing aids. It doesn’t matter how careful you are, some amount of water will get into the case. The dehumidifier dries the devices out without damaging their complex electronic parts. Now when your phone rings you won’t have to remove your hearing aids. However, some brands don’t have this feature. Wireless streaming capability and Bluetooth enabling are features you will want to consider when shopping for new hearing aids. The same way that earbuds or headphones use Bluetooth to connect to your phone, these kinds of hearing aids also do that. Would you like to stream a movie? This is another case where wireless features are useful. With Bluetooth or wireless, the hearing aids can receive sound from your TV or MP3 player. Most hearing aids come with a telephone adaptation, also, that works for cell phones or landlines. Telephone adaptation makes use of a telecoil to receive signals from the phones so you can hear them in your hearing aids. That’s correct, machine learning capabilities are available in many models. Certain devices will make volume adjustments depending on the setting by remembering your preference and you don’t need to do anything. You can also just press a button and load a particular setup stored in one of the multiple programs. Loss of hearing and tinnitus go hand in hand for many people. You will hear sounds more clearly because your hearing aid can produce tinnitus masking noises. The ringing will go away after the masking sound cancels the tinnitus. Not all brands come with this tinnitus masking technology. If you are shopping for hearing aids, and need this feature, you will have to ask for it. Data logging is one of the more modern features in hearing aid technology but a compelling one. The devices log things such as when you use the hearing aids, times you make volume adjustments and what background sounds you encounter. The advantage is your audiologist or hearing aid retailer can use this data to make essential modifications to the devices to enhance their sound or give you insight to go on when shopping for new hearing aids. Hearing aids that come with remotes let you to quickly change programs, adjust the volume or even act as a Bluetooth streaming device. All of these features permit you to do things that were impossible years ago despite the fact that they aren’t all brand new. Also, advancements in hearing aid technology are always being made. Be certain to take a look at the latest features when you go shopping for a new hearing aid. Schedule an appointment with a hearing care expert to see them all.